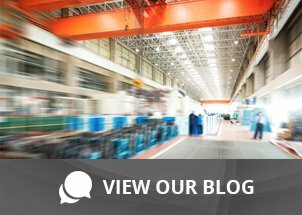 How Will RFID Make My Warehouse More Efficient? | Taylor Data Systems, Inc.
How Will RFID Make My Warehouse More Efficient? RFID supports the delivery and collection of information associated with an item, which could be a product, a product component, a pallet, forklift, etc. With a basic understanding of what RFID is, you can easily determine how it can help your process. Using radio waves, RFID can identify objects remotely. This is done through an RFID tag that is attached to items you want to identify or track, and an RFID reader takes information from the tag and transmits it to your software application through an antenna. In some cases, you may even want to send data from your software application down to the item tag. What can we do with RFID? Without RFID, finding out how many hours a particular tool has been in operation would be possible, but not simple to track and time consuming to record. Setting alerts on items that are due for maintenance would be another task that can be done manually, but would require human interface and time spent tracking and calculating hours of use. When you have an RFID application in place, you can easily obtain this kind of information without having to be near the object. You could be in another location altogether and still be able to find out required information directly from your software program or ERP system. This kind of flexibility helps make operations more efficient because now you can quickly and easily record and manage information on items that you don’t have to even see or touch. It also assists in maintaining quality standards, helps you track goals and milestones, and even provides useful historical data to enable quality improvement down the road. Choosing an RFID solution that will work for your business involves patience, planning and research. It also involves careful selection of a solution provider who is experienced in RFID applications deployed in environments similar to yours. Every organization has their own unique needs and requirements when it comes to RFID, so having the flexibility to customize your application will offer great benefits. Here are a few applications where RFID has helped our customers improve productivity and bring greater operational efficiency to their warehouse and factory floor. Product Tracking: Tracking products through the production process. Individual products are tagged and read during several points in the process. Once the item is read, their ERP and PLC is updated with the latest product data. PLC integration enables the system to determine where to send the roll of textiles based on certain parameters. Originally they were using fixed-mount barcode scanners, but found that successful scanning of the barcode was inconsistent due to placement of the barcode label. With RFID, the reader just has to be in the vicinity of the tagged product in order to have a successful read. Harsh Environment: Manufacturer with a production process involving exposure to extremely high temperatures, along with gels and other liquids throughout the process. A standard barcode label would not likely withstand the heat and liquids (it could fall off the product or become unreadable), which would affect the quality of the overall process. Rugged RFID tags were perfect for their environment. The product itself is not tracked, but the tool that holds the product on the line is monitored. The 1st read location identifies how many times the tool has been used. After it exceeds a pre-defined number of uses, a light stack and audible annunciator is invoked alerting line personnel to remove the tool and send it out to have maintenance performed. The 2nd read informs the line operator about critical information with respect to that particular product during the production process. The 3rd and final point in the process the tag is read and a serialized barcode label is printed applied to the final product. At this point the product has gone through the production process and can be safely labeled. Dock Door Verification: This solution was developed to prevent products from being loaded into the wrong truck for shipment to customer. 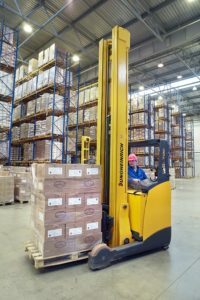 As a warehouse fork truck operator is moving a pallet of product into the dock door, the pallet tag is read and a query into the ERP system validates that the pallet should be loaded into a particular dock door. If they approach the correct dock door, a light stack illuminates green. If it is not the correct door, a light stack illuminates red and a horn is blown – alerting the worker. The customer realized immediate ROI in the form of a reduced number of shipping errors; this translates into lower costs and higher level of customer satisfaction. Considering RFID but not sure how to take that next step? Learn more in our previous RFID blog. We can also help you put together a strategy that will optimize your processes, improve productivity and control costs without exceeding your budget. A good place to start is with a site assessment to determine your basic requirements. Contact us today to schedule an appointment.